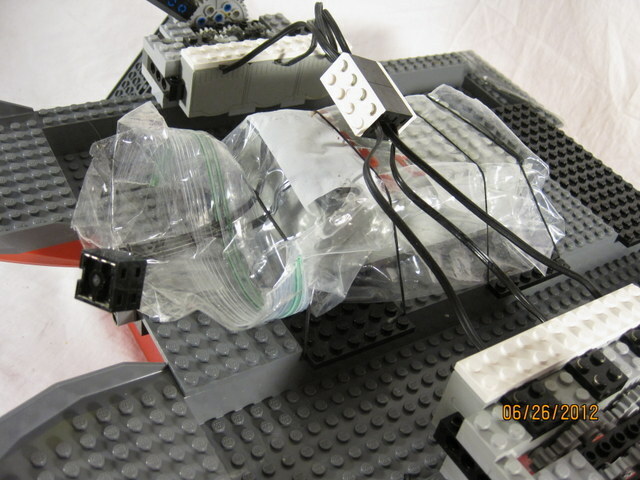 ROBOTC.net forums - View topic - BrickWorld Chicago 2012 Wrap-Up! First off, sorry for being late. I had contacted BrickWorld to get some robot names for my competition videos, and they took a bit to respond. I also had some trouble editing the videos. Note to self: Only use Windows Movie Maker in Win-7, NOT Win-8. Anyway, on to business. BrickWorld Chicago goes Thursday-Sunday in the third week of June. The first round was a practice run. The next three clips are of the actual contest. I lost, due to a misunderstanding of the rules. I thought the cubes would be scattered across the ring, but they were not. I also built a boat on Thursday, using hulls I had bought from a vendor earlier in the day. More on that later. So, Thursday done, I finally got to bed around midnight, as with every day I was there. 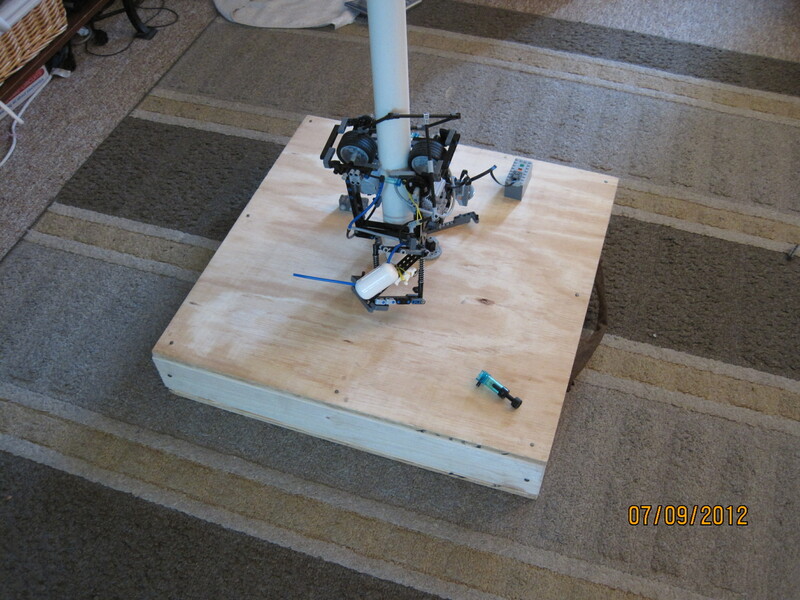 Friday night I spent a couple of hours on my Satellite Repair robot, almost finishing it. I also played a simplified round of SRR (Super Robo Rally). Saturday night was taken up by another game of SRR, but this time it was the full game, so it took about 3-hours, but boy was it fun! Bryan Bonahoom, BW cofounder, walked in when it was almost over and put in the TECHNIC set #8066 in as a prize, but then Steve said (he was almost at the finish, of course) that first place got to keep the board, and second place got the set. I won second place, and the set has some very good elements I've been missing. Notice the lack of a programmable brick on mine. It was mechanical. Pack it on up, move it on out. Bye bye BW, see you next year! I'll be posting individual messages for each thing I made. If you'd like to hear more about anything, just say so. If you think I missed something, also say so. 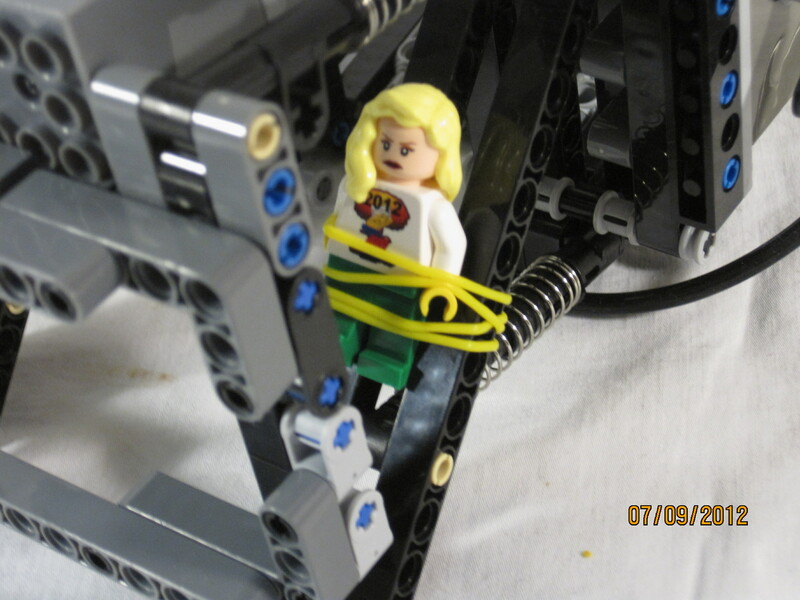 Re: BrickWorld Chicago 2012 Wrap-Up! As a side note, I picked Seattle to move to out of places that appeared to have activity in robots. Chicago was on my list, but one bad really cold experience there earlier and life, and one really pleasant experience in Seattle during previous time working for Ms Federal, made the choice for me. In retrospect, maybe I should have bought a bigger coat. I love Seattle, but robotics is pretty dead here, other than the First kind of things. Its great to see enthusiasm for it elsewhere. 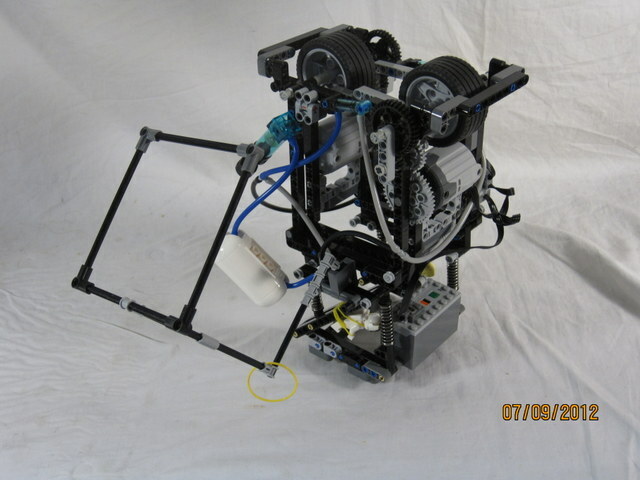 Assuming the rules go 'LEGO mindstorm kit only' I'm going to make a big push it needs to be NXT V1/V2 only. 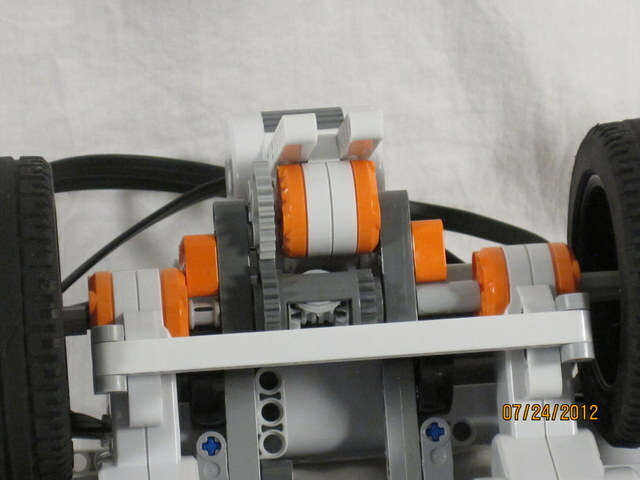 Your robot juggernaut, looked to be using RCX brick style parts as opposed to NXT Technic/beam style, and it appears the new stuff would be at a disadvantage. I have very few bricks (and none of the mindstorms RCX stuff), and no experience, so if it 'LEGO only' ends up meaning the old stuff can compete, I won't. If it goes truly 'open' class, I'll depend on software to make up for it and a few non-LEGO compliant sensors. Any comments? You went with straight touch? That's pretty impressive. I'd like to see more details, including code. Ah, so you've experienced Chicago area weather. This summer has been horrible, a month of "official" days over 90 degrees. A week of "official" days over 100 degrees, but my thermometer disagrees. Seattle dead on robotics?!?!?! The birthplace of RoboMagellen?!?! Of LVL1 hackerspace?! Maybe you mean LEGO robotics are dead? Some competitions go "NXT set only", but not many, as lots of people don't like the limits of that. 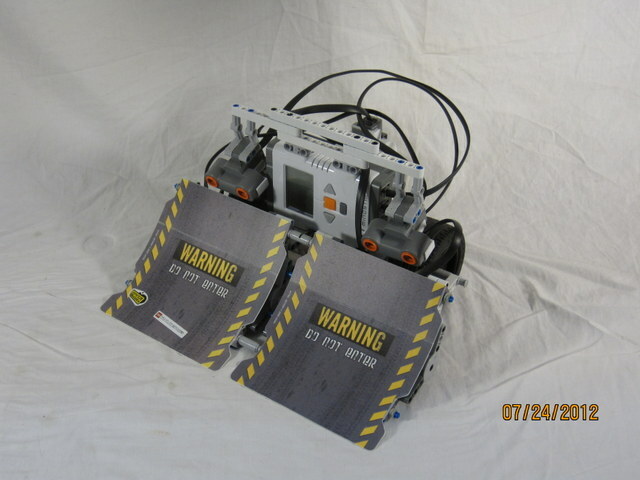 The BrickWorld rules state that a robot must weigh a max of 1kg, a max size of 1x1 foot (no limit on height) and be made of 100% LEGO parts, meaning any controller can be used. Juggernaut did use a RCX as the controller, but I wouldn't really say it had an advantage. It just used a different strategy, which was apparently better than most of the other competitors. Juggernaut was probably the strongest pusher there, but was pwned by the faster robots. Every robot Juggernaut was against (except for Decoy) wasn't fast enough to get to Juggernaut before it finished turning. The fact that Juggernaut tied against Decoy the first time was just lucky, as demonstrated during the finals. Regarding "open class", I know of even fewer competitions where custom sensors were allowed (not counting official [Dexter, MindSensors, Hi-Technic, etc] 3rd party sensors), but I've never seen a limit on the programming language. P.S. how do you like my new avatar? Yeah, robotics is dead here. I wont go into it in public (unless someone from here wants to disagree), but take my word for it. The First stuff seems to be going good. But I've heard too many times, how it is so contest focused there is no real robotics being done in it; there is no place for mentoring general robotics, instead only mentoring the final goal (which is more of a traditional electrical and mechanical engineering problem) is desired. There is very little attention to autonomous operation in what I have seen so far. That and the politics of it sound frightening. The more I re-read the current rules proposal for BrickCon, I think it is what I would prefer, I just don't know which class, 'stock NXT kit only' or 'open' to build for, since there has been little response so far (and to be fair, I don't think anything has been announced outside our LEGO mindstorms group with only 2 attending last time, yet). I want to do something, so I'll do whatever I can, if it happens (which is still up in the air). 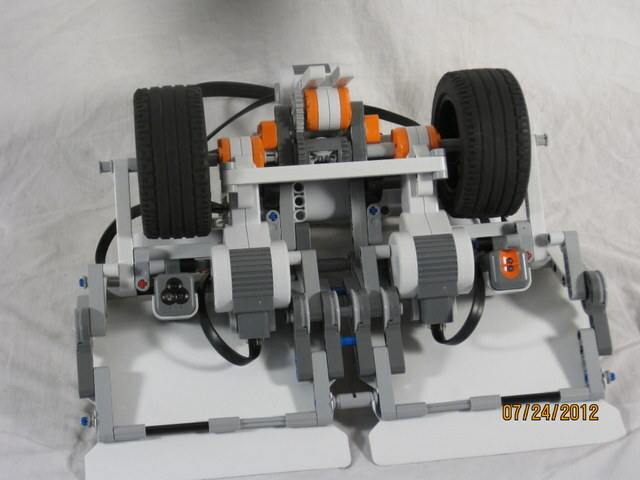 Juggernaut is a LEGO MindStorms RCX LEGO sumo robot designed to compete in the BrickWorld Chicago 2012 Super Sized Sumo event. It placed fourth! I actually kind of made it as a joke. 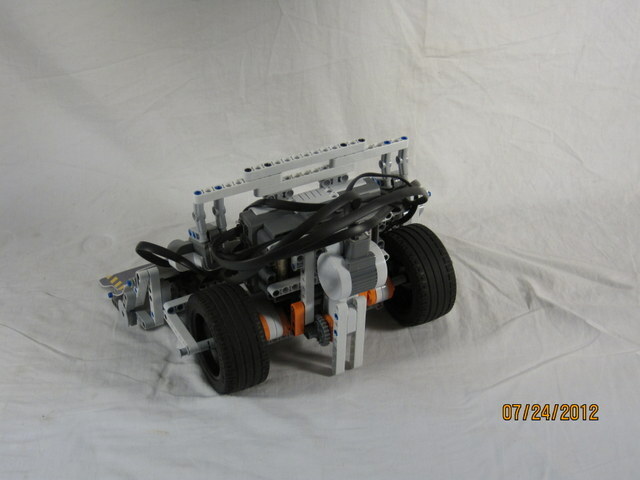 There was a time when I was stuck on another robot, so I built and programmed this in about a day. I didn't expect it to do well at all, but it actually came out at the top of it's pool! And, managed to tie a bout with the deadly Decoy! Juggernaut found it's opponents using these "feelers". Each one depresses a touch sensor when bent. The rubber bands pull them against the buttons, and provide some resistance against false positives. The strategy was like this: At the start, it would turn towards the opponent, and start moving forward. If it hits the edge, randomly choose which way to turn (it only had one light sensor) and for how long. If the left sensor it hit, turn left. If the right sensor is hit, turn right. If both are hit, keep going straight. The tangle of wires that results from 4 PF motors, 2 converter cables, and 3 sensors. Also, the start button. The start button is attached to the same port as the light sensor, so when it's pressed the amount of light read equals "100". This doesn't interfere with the match, since that button is only used to start it. That's one advantage the RCX has over the NXT, is it's easy to multiplex some sensors. When the "run" button is pressed, it waits for you to press the left feeler, right feeler, or this button. This determines which way it turns at the start, and for how long. Left feeler = left, right feeler = right, button = back. After that, you press the button shown in this photo to start it if you didn't choose to go backwards. Juggernaut is driven by 4 PF-M motors at a 5:1 ratio, giving a final tourqe of 72.6 Ncm. Even when the motors are coasting, I can hardly turn the wheel! Good enough for you, Spike? yeah, good enough for me, thanks. Those wedge bricks; I think i have a couple of 'bionicle teeth' from the NXT kit, and that's as close as I come to something like that. I need to watch the video again and see how you got beat. Then there is the fine line between, building something fast which is ok and probably a good strategy, and building something destructive, which is not ok.
And quit taking 'a day' to build stuff. I 've got like 2 months, pretty much full time, and I'd bet I will not have anything done in time. Dang kids. Oh never mind, I hear it from the adults too "I started on this last night..."
They aren't really "wedge bricks". They're just normal roof tiles, 33* and 45* I think. As to how I got beat, the fast robots (read: Decoy. That was the only really good one Juggernaut was against) were able to get at its side, or because of the speed jam under the "skirt" and lift up the internal part so that it didn't have any traction. I assume you are joking about that first part, right? Although, that might be a good idea if the RCX's processor is fast enough, and if its got enough memory. Definitely a good idea for improving W.E.D.G.E. though. It also has minimal software, because I didn't have time to write anything complex. You wanna hear something I learned in the past year or so? Just BUILD!!! You never know if it'll work till you try!! 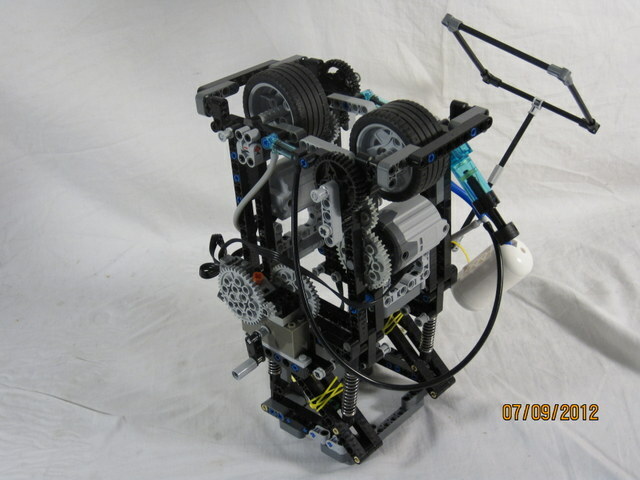 At BrickWorld 2011, I did spend all of two months working on Double-Trouble, my robot for that year. And it was because I was too worried about what might not work instead of just trying things! "W.E.D.G.E." stands for "Wheeled Envoy Doggedly Gyrates Ecstatically". It has a wedge (duh!) 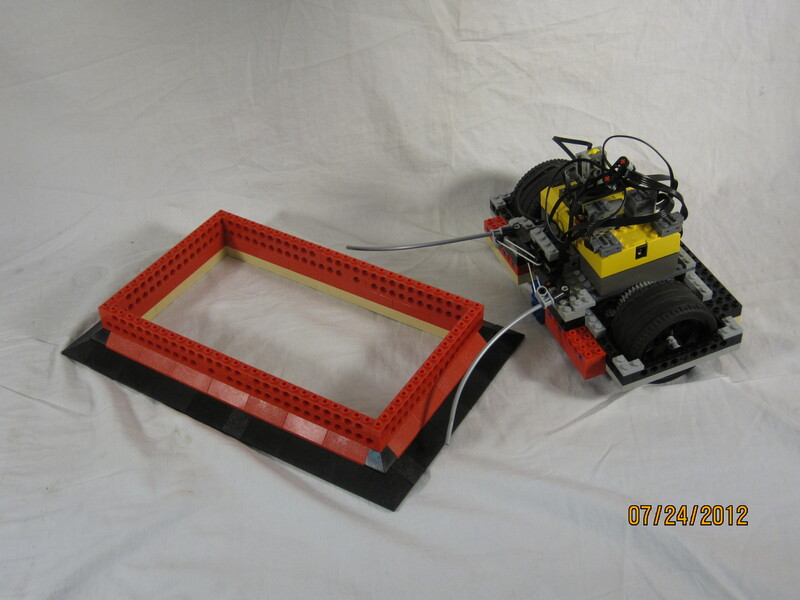 made out of LEGO Racers ramps, allowing for a very thin edge and superior wedging ability. This robot went through several revisions, with this one being the best. I went through about ~4 designs prior to this one, having to completely tear apart each previous design (I'm not always quick, Spike! ). This pic shows the light sensors (one is the LEGO color and the other is the LEGO light. 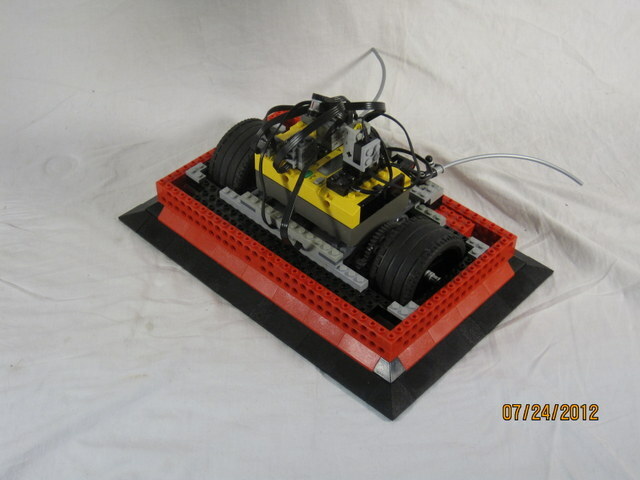 I didn't have two LEGO lights available at the time) and the drive system. Notice the three motors. More on that later. Also the white beams sticking out from the middle motor. Those were added at the last minute to prevent W.E.D.G.E. from doing a wheelie when going forward. The balance was too far back to prevent it, so I added the beams. W.E.D.G.E. is driven by three NXT motors. 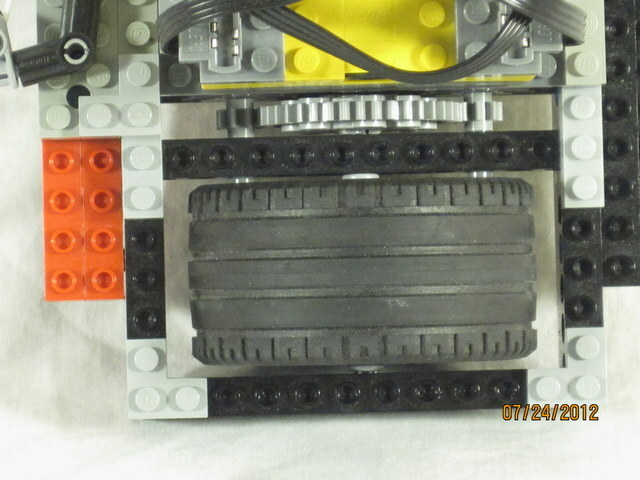 One on each side, going into the two sides of a differential gear, and one in the middle connected to the casing of the gear. This allows the middle motor to turn on and help to push when it's charging. It just has to go the average of the speed of the other two motors. The wheels are the 81.6 diameter road tires from the Nitro Muscle. EDIT: Oh, cool. I just noticed I'm a "Master" now. I didn't know there was that rank. Very cool. I really like the idea of kicking in a 3rd motor, that's something I had not thought about, and might 'borrow' if a competition happens. You wouldn't happen to have any pics of something that beat it would you? What can you say about the software? More than a random number generator? Did hardware or software make the difference? I've been a programmer all my life, so not being so experienced/good at the mechanical aspect, I try to do more in software. And unfortunately that's where I find, the software environments just aren't up to par with modern day programming, although I still think RobotC gets a little closer to it than others in practice (debugging, fairly painless ide), LeJOS does have some appeal in modern software design (OOP language). My main PC crashed yesterday (fried MOBO). I've been wanting a new one for a while, so I try to think of it in a good way. I'm pretty good about backups, and ideally hope the drives survive into a new PC, but it just has been in par with the a terrible week, probably the worst in several years, everything has gone bad this week. I'm afraid to cook for fear of fire. Congratulations Master, I always said you were anyhow. update: I didnt have any luck finding 'racer ramps' that look like what you used. Do you remember from which kit they came? No, I don't have any pics of Vader. He was the only one who really "beat" me, if you define beat as winning 2/3 bouts. It wasn't random numbers. Although, the logic of this one was also simple. Psuedo code below. Do both my eyes see the opponent? charge until I hit the edge, and turn opposite the way of the light sensor that detected it. 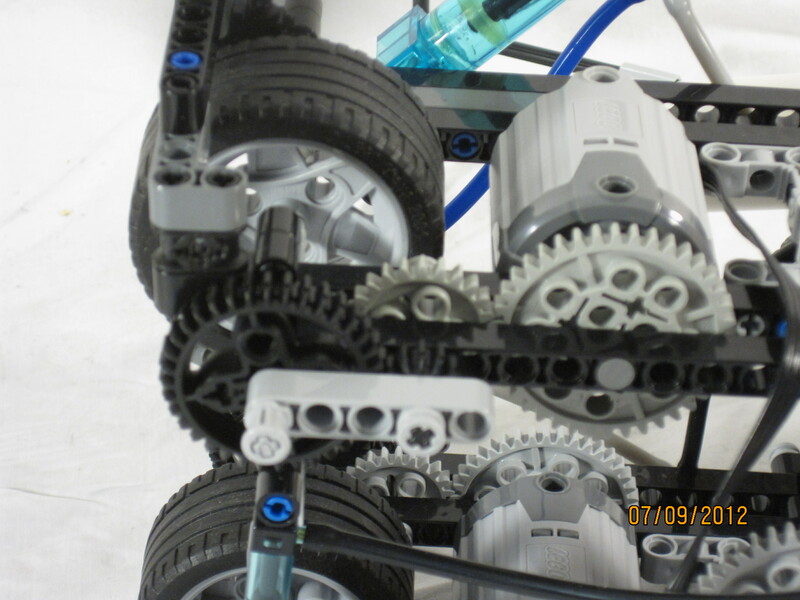 [unexact quote="Steve"]Your robot had a better mechanical design, but I had a better program and strategy. [/unexact quote] So for next year I'm probably going to greatly enhance the software, and modify the mechanicals to get max performance out of W.E.D.G.E. I've been a programmer for less than a year, but I've had experience with mechanical design since I was ~5, when I got my first Erector (or was it K'nex?) set(s). When I was 6, I got my first MindStorms set, the Robotics Invention System 1.5. But, even then, I do find the programming softwares for LEGO lacking. I've been fiddling with some Java and Arduino lately. Really like objects and interrupts, and wish that more LEGO softwares had them. Thanks! Actually, I had never thought what I did was that great until I started meeting people like Steve, and started going to ChiBots (the Chicago Robotics Group). Click on the image of the part. There is a link that says "Catalog entry", click on it. Under the name of the part, and to the right of the image, is a text that says "This part appears in x sets" and a link to view them. An addendum to that. I didn't think what I did was that great until the ChiBots members started whispering amongst themselves when I showed the FlexPicker, and my dad told me that some of them asked how much he helped. He doesn't. Last edited by NeXT-Generation on Fri Aug 10, 2012 11:34 pm, edited 1 time in total. 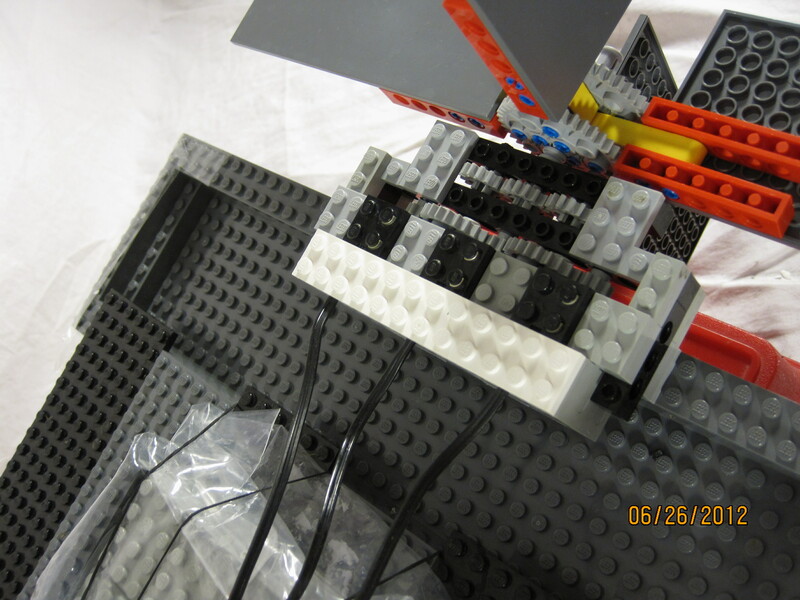 Paddle-FAIL was designed and built in less than an hour, on the Thursday of BrickWorld. I saw some cheap hulls at a vendors booth, and decided to make a boat. It had no steering control, not even a rudder to keep it straight. Well, I guess that's what you get for something made without thinking . Each wheel was driven by three LEGO Mini-Motors geared 3:1. Two old-style AA battery boxes were wired together to increase the Amperage, sealed in a plastic bag, and connected to the motors. The motors are water-resistant, so the amount they got, they still run just fine. The connections are a bit rusted now, though . Like I said, the battery boxes were sealed in a plastic bag, rubber banded onto the boat, the end taped up around the power wires, and the power wires connected to a hub connecting all the motor wires. None, yet. But I'm working on a port of RobotC that can be used to program plastic! And now, last but not least, my personal favorite, PileDriver!!!!! Designed for the Satellite Repair Challenge, PileDriver placed 2nd to Steve's "Columbia". 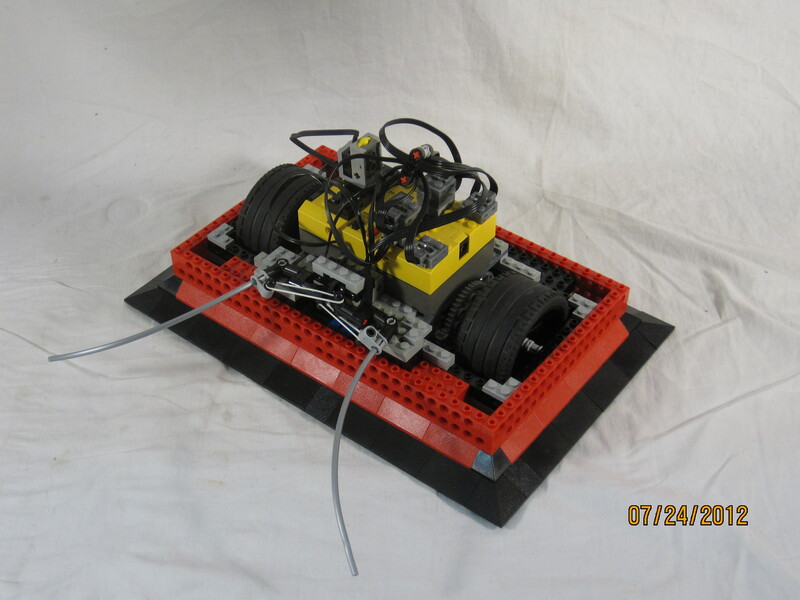 It was a completely mechanical design, using a wind-up timer for the delay and pneumatics for the "descent". I gave everyone a good laugh when, during a test, mine fell from the top of the pipe and shattered, leaving the internal frame (it looked kinda like this. Except it was broken more.) still around the pipe at the bottom. The laugh was from me asking if it counted as "safe" if the minifigs were still attached to that frame. It was ruled that, if the main body was still attached, and the minifigs were all together and attached to that part, then it was safe. On the front, you can see the PDI/SL (Pneumatic Descent Initiator/Satellite Launcher) the air pump, and the air tank. 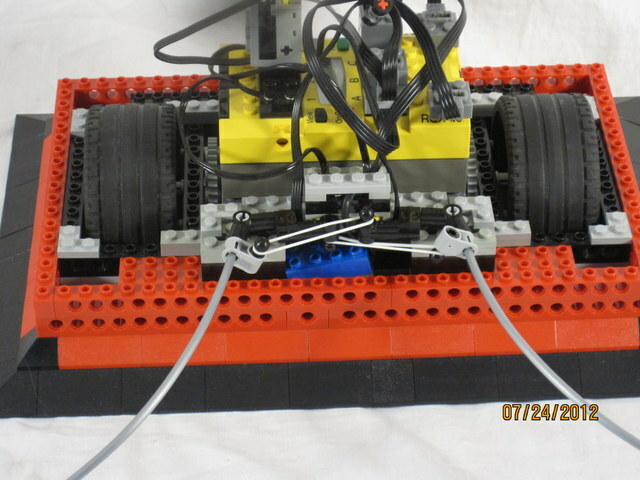 During a run, the yellow rubber-band hanging from the arm would be attached to a pin by the small pneumatic cylinder, pulling the square against the pipe. At the top, this would pull over across the pipe knocking the "satellite" off and flicking the pneumatic switch, extending the cylinders, which causes the wheels to lose contact with the pipe, thusly sending PileDriver into a free-fall!! Here you can see the timer, and the other cylinder. PileDriver climbs using two PF-XL motors, one on each side, geared 1.8:1. They're each plugged into a PF AAA battery box through the timer switch. 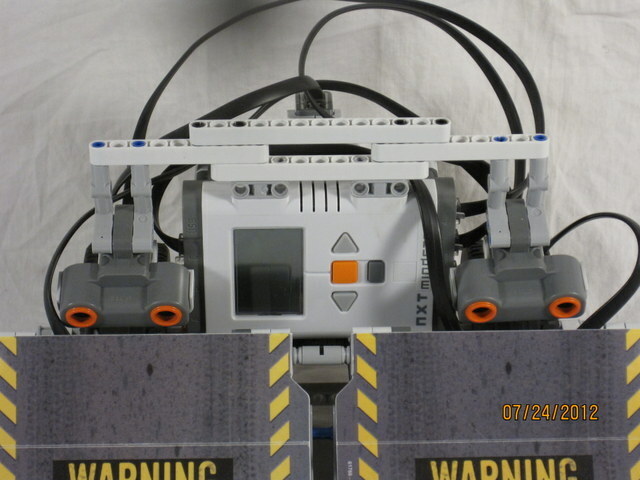 Originally, the rules stated that the robot must wait at least two seconds before starting to climb. Of course, after seeing Steve's robot, they abolished it . EDIT: I was just now told that they didn't change the rules, the rules were just stated so that it didn't specifically state that you must have a timer. It is made using this part. 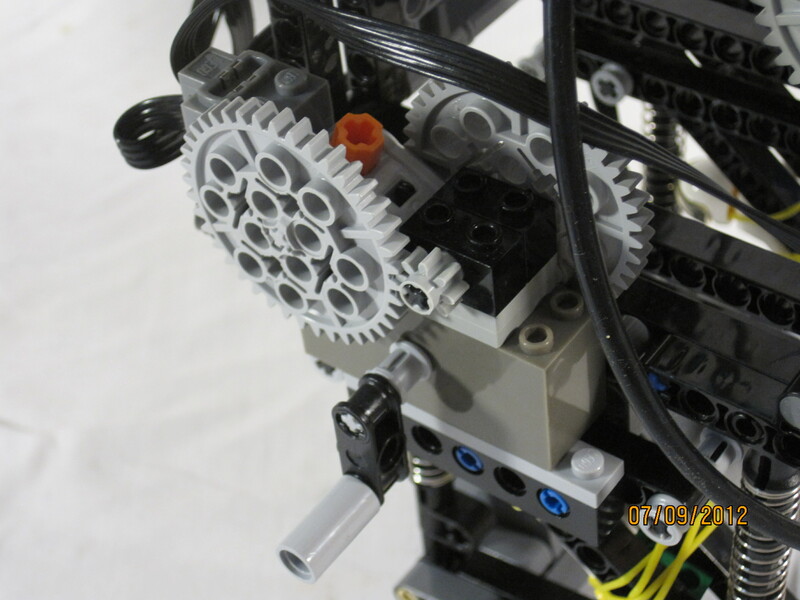 There is a 25:1 gearing in between the motor output and the switch. Fully wound, there is about a 2-3 second delay. My "method" of attaching the minifigs. Well, they never fell off! Last edited by NeXT-Generation on Mon Aug 13, 2012 11:42 am, edited 1 time in total. So you are repairing the last earth satellite, and not even using a CPU? How's you mars lander design going? Trying that one without a CPU also? I can just picture the next ISS space walk, with the astronauts tied to the robotic arm around their chest with rubber bands. I guess duct tape isnt LEGO though, is it? Seriously, cool stuff, I'll have to go back and rewatch the videos. The first time I watched, I was comparing to the seattle rules and was a bit thrown. Now that I see your rules, it makes more sense. I still might try something along these lines, i'm curious if the NXT / Rangefinder is fast enough to slow a free fall (by tightening a grip when it lowers to a certain height) . I'll be sure to try with a foam landing pad first. That competition looks cool! I heard that BW had something similar in previous years, before I ever attended. Too bad it's kids only. Well, except for the kids . Yep! One thing doesn't make sense to me, though. In the rules, the pipe is a "space elevator". How come they can build a space elevator and keep it together, but not just make more satellites?!?!? Mars lander? Interesting idea. 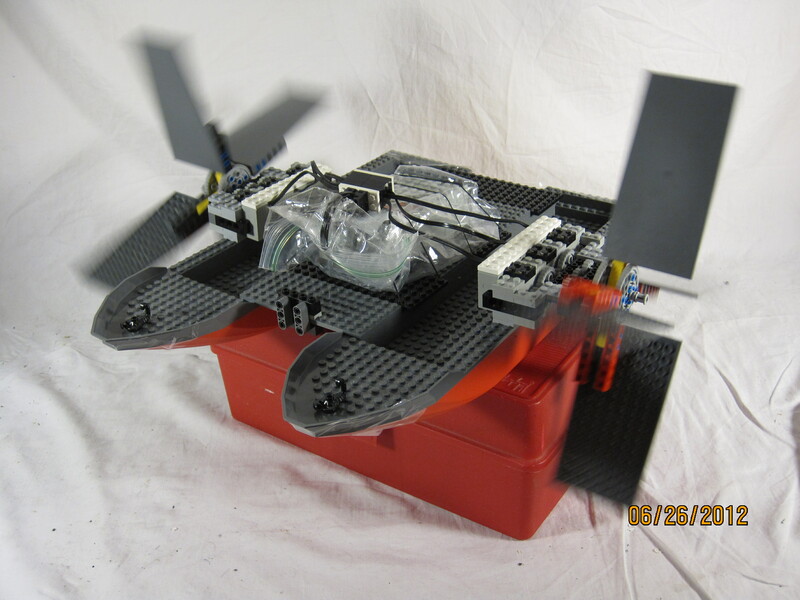 Maybe a quadcopter with the props disguised as the engines for the descent stage, and lowering a LEGO Curiosity? 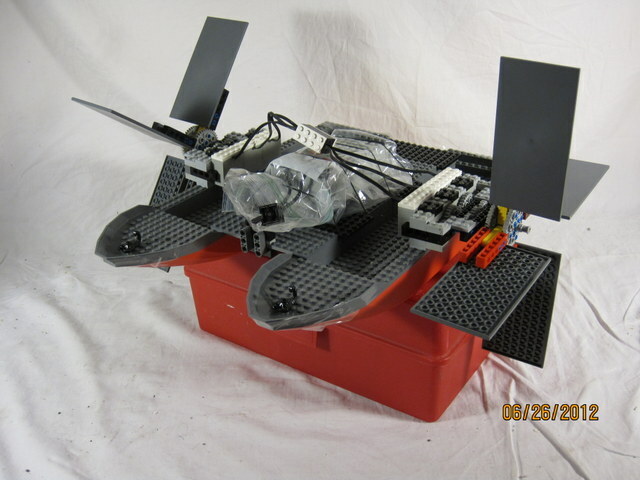 How much weight can quadcopters lift? 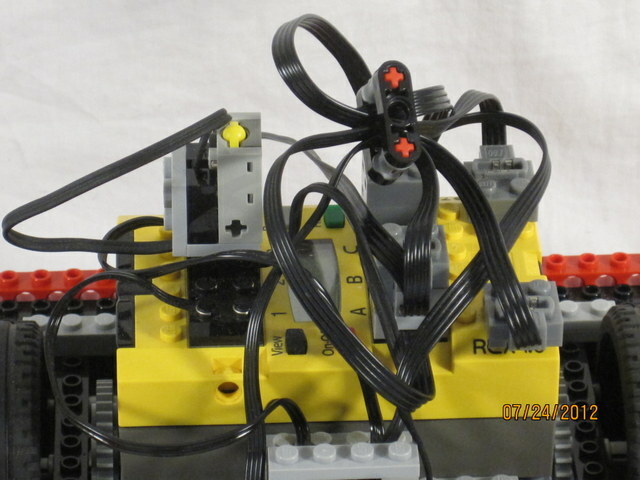 Random fact: The Apollo 11 Lunar Lander computer had the same memory and processing power as the LEGO MindStorms RCX. I thank you yet again! I doubt that, during a free-fall, LEGO motors or pneumatics would be able to react fast enough to stop the fall. PileDriver hit bottom in less than a second. Foam landing pad, right.... Wish I had thought of that. On the origin of names. Juggernaut: The definition of Juggernaut is "any large, overpowering, destructive force or object, as war, a giant battleship, or a powerful football team." Ignore the last two bits. I think that this was a good name, because when the wheels were in contact with the ground, and the inside not propped up, its pushing power was practically unstoppable. W.E.D.G.E. : I don't know. W.E.D.G.E. stands for "Wheeled Envoy Doggedly Gyrates Ecstatically". I wanted to call it W.E.D.G.E., but wanted to also make it interesting. Paddle-FAIL: I think this one is self-explanatory. PileDriver: I called it PileDriver because, during preliminary tests, it would bounce at the bottom, mimicking the motion of the construction machine bearing the same name.